Low stakes roulette is a great low limit version of the world’s most popular casino games. You can play low stakes roulette online, on your tablet and on your mobile for as little as 1p per spin. The low cost of each spin makes low stakes roulette an ideal platform to try out your roulette systems, or to just have some budget friendly fun. 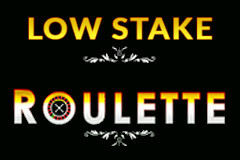 Low stakes roulette is an ideal introduction to this enjoyable table game, with odds of 36/1 for a straight up number, and all betting options available that you would expect to find on higher level roulette games. Low stakes roulette allows you to place you chips on corners, splits, streets, colours, odds and evens and high and low numbers. Should you wish to start out low then increase your stake, that is not a problem, as although low stakes roulette starts at just a penny, the maximum per spin is a hefty £3000 which is ideal for any roulette system or the larger budget players who may wish to start out low. Low stakes roulette plays and pays the same as a regular roulette game, with an average return to player of 97.27%. Low stakes roulette is available to play online at Sky Vegas, and with their £10 free offer, you could have at least 1000 spins on this fun little table game.